Looks like I may have a weekend free as part of a work trip to Washington in April. It seems Shenandoah National Park could be my best option. I’m thinking drive from Washington Friday evening, activate short hike summits off Skyline drive Saturday and Sunday, drive back to Washington Sunday evening. 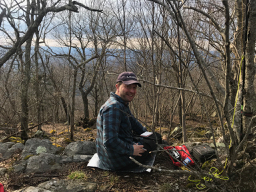 I’d appreciate itinerary tips from those with local knowledge to get the best SOTA weekend I can! Is Shenandoah the best option from Washington for a weekend? Should I drive Skyline as planned? Or is there an amazing hike that I should dedicate my time to that maybe takes in fewer summits with less driving? Where should I stay? I am pretty flexible, and will happily stay in a hut or a fancy hotel. Dickey Hill, N Marshall, Compton Peak, and Hogback can all be easily done in a single day from points along Skyline Drive. Stony Man and Hawksbill are also easiey to nab, as are Hazeltop, the Pinnacle, and Flattop. My favorite peaks in the park are Knob Mountain, which is a lovely hike, but it’ll take you most of a day to get that one. Robertson is also great, but is also a longer hike. PS: I’d consider a joint activation with you if you’d like a hiking partner, and if the timing works out. Let me know if you’re interested. Look up my email on QRZ.com if you’d like to. Thanks for the tips Nate. Just been checking out your blogs for some of the peaks too, a fabulous reference! Got me thinking I might perhaps do one day of the easy to nab ones from Skyline drive, and then one day dedicated to a longer hike for Knob Mountain or Robertson. I may well take you up on the kind offer of a hiking partner, be great to have company with local knowledge and distinctly more SOTA experience than me! You could probably fit in Dickies on the way out the park also… if you start your day early’ish. There are a few easily accessible AT shelters that can be used for a simple overnight stay. Thanks Richard. Ticks I’m used to. Snakes is a different matter. As are the bears! Booked to be there the weekend of 13th and 14th April. Staying in the Skyland hotel which looks to be in the middle of Skyline drive. Now for the summit planning. For a start W4V/SH-002 (Stony man) looks to be walkable from the hotel. From the Skyland hotel you could easily walk to both Stony Man and then (further South) Hawksbill using the AT mostly. On the tick front, please be very aware… everyone knows about Lyme Disease… personally I’d be more concerned about the other 11 nasty diseases a tick bite can convey, and the old thinking about just wait 24hrs a look for a rash and it takes >4hrs to xfer is all a load of hogwash per the latest intel. I doubt you see either… but you never know… Last time I was down there I saw a bob cat! Nate - in case you see this here. I’d like to take you up on your offer of a joint activation if it works out. I couldn’t see your e-mail on QRZ.com and have tried a PM here instead but haven’t heard back. Still on for this weekend. Myself and M0PCB will be activating the peaks people have recommended off Skyline drive Saturday and Sunday. With maybe a cheeky one Friday evening if I get there in time. SSB for me, but MOPCB may well be on CW. Will get alerts up nearer the time and self spot if signal permits. 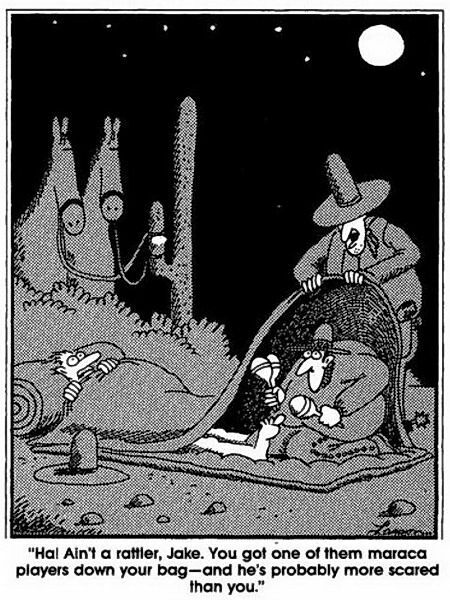 I think you will be there before the worst of tick season, but the usual precautions (spray your shoes and lower pants legs with DEET, tuck your pants into your socks) will help if needed. We saw only one rattlesnake the entire time. It was stretched out across the Skyline Drive early in the morning, probably trying to get some residual heat from the road. We used a hiking stick to gently shoo it off the road and away from the risk of being run over. The Appalachian Trail in the park runs along rocky ridgeline, which presents two attractions for rattlesnakes: they may shelter in cracks and openings in the rock; and on sunny days they may sun themselves for warmth atop the rocks. Watch where you put your hands and feet when you set up your gear. You should be fine. There are LOTS of black bears in the park, and we had sightings along the trail several times. We were there in the autumn, when they voraciously seek acorns as part of their effort to fatten up for the winter hibernation, so I don’t know what your springtime experience will be. I attended a lecture on bear behavior given by a park ranger, and he said they try to avoid contact with humans if they can avoid it. He also advised that the one thing that best warns them off is the sound of a human voice singing - apparently they can hear that further away than the bells so many people wear on their packs. As a result, during our hikes I went through my entire (and extensive) repertoire of 1960’s rock and roll songs. We saw a pair of bears disappearing down the trail as we came over a ridge once, and another sighting of bear heads popping up from the vegetation about 20 meters off the trail, but none approached us. Your experience may vary, especially if your singing voice is more pleasant than mine. Weather permitting you can expect to enjoy lovely hiking and gorgeous views of the valleys on either side of the park. Enjoy! Too true. When the bears discover hearing protection we will need new ways to discourage them. 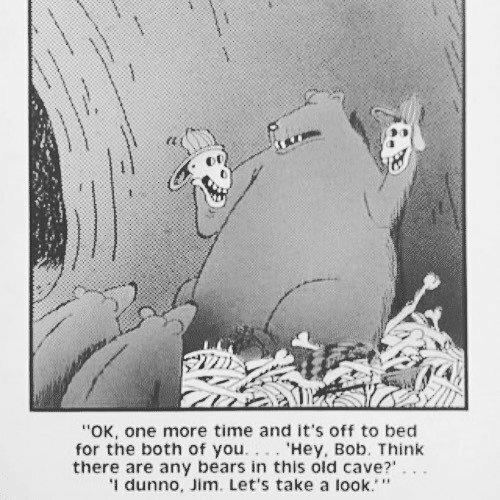 Bears… Snakes…, Humans… That means Larson! Copyright belongs to the copyright holder. Thanks everyone for the tips above, all spot on and very useful. Had a great weekend activating with Ian M0PCB / AD5XI. Shenandoah National Park is one of my new favourite places! Saw lots of deer, but no bears unfortunately. (Guidance suggests they are wary of humans and any sighting much more likely to be an amazing wildlife encounter rather than life threatening when following advice above). Had sunshine, mist, mizzle, torrential rain and thunder and lightning over the weekend. Made me feel quite at home as a Brit! Got up there early and tried Dicky Hill Friday afternoon, but couldn’t get any contacts before it started raining and I needed to leave to make dinner. Saturday bagged Stony Man, Hawksbill and Hazeltop. 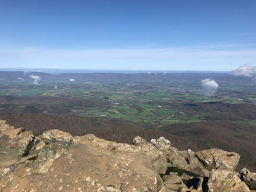 View below is from Stony Man and other picture is on Hazeltop. Sunday got The Pinnacle and Hogsback. Got to the top of North Marshall but the thunder and lightning followed by proper rain meant we headed straight back down. Could’ve got more with a less relaxed pace and quicker activations. Took us both quite a bit of work to get the 4 on each summit on HF, me on SSB and AD5XI on CW. Mostly 20m and 40m. Thanks to all the chasers! One guy I had a contact with who wasn’t even a chaser got an account on Sota Watch and worked out how to spot to help me out! Definitely worth a visit if you get chance. Hopefully I’ll be back one day. Can also recommend Pave Mint Bar and Grill in Front Royal for BBQ and a beer if you are ever over that way.